Melbourne and St Kilda took centre stage for the JLT Community Series clash at Casey Fields on Thursday night – but it was the curtain-raiser to the main game that gave an exciting glimpse into the future. Members of the Casey and Peninsula sites of the Melbourne Football Club Academy locked horns in a wonderful representation of the very best under-15 football talent in the region. As Melbourne Football Club Academy Manager Kyle Docherty explains, the game was an important step in a season-long journey to the elite level of the game. “It provided the boys with a great opportunity to showcase their skills in front of a big crowd,” Docherty said. 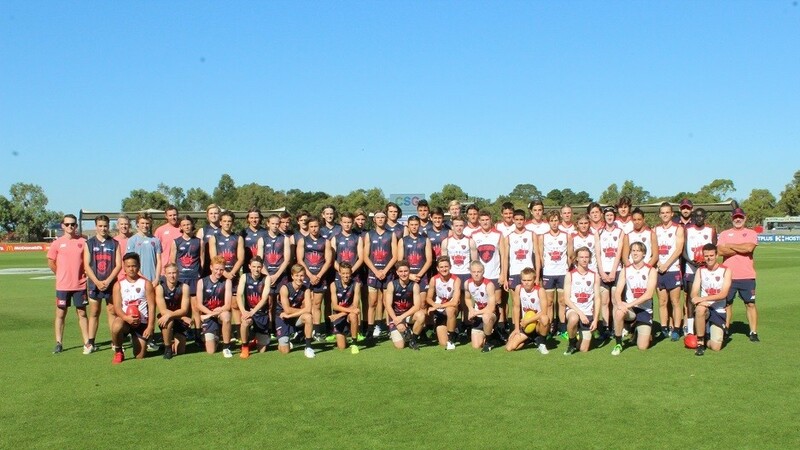 The V/Line Cup is AFL Vic Country’s premier regional junior championship, with the very best young talent from country Victoria looking to make their way onto an Under-16 TAC Cup list in 2019. The Melbourne Football Club has formed a strong bond with local junior leagues with players from the Mornington Peninsula joining their counterparts from the Frankston Districts Junior Football League and the South East Juniors on an elite-level pathway. Docherty said the academy had a two-tier approach to football in the region. “We’re here to support the existing talent pathways that have been created that lead to the Dandenong Stingrays for both boys and girls, but the second part of the academy is to provide opportunity for indigenous and multicultural players and new participants to the game,” he said.